The route begins near the impressive Norman castle in Castle Acre. This historical village has many points of interest to explore: as well as the12th-century motte and bailey castle, from which the town gets its name, there is also a bailey gate and the remains of a Cluniac priory. The route heads southwest towards the small village of South Acre, crossing the River Nar by a ford (with adjacent footbridge) along the way. From the ford there is an excellent view of the spectacular ruins of the Cluniac priory that lie just to the north. Castle Acre Priory was founded in 1089 by William de Warenne, the son of the first Earl of Surrey. The remains are managed by English Heritage and have a shop, toilets and picnic area. 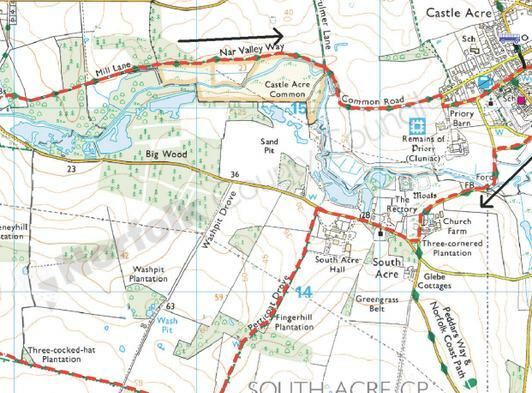 At South Acre, the route passes the village’s church and South Acre Hall before following tracks through farmland above the Nar valley to arrive just east of West Acre. Like Castle Acre, West Acre also has the remains of a priory, although this one, founded by Augustinians in the 12th century, is not so well preserved. From West Acre the route heads east along the Nar Valley Way back towards Castle Acre. After crossing footbridges close to where West Acre Mill used to stand, the walk passes through peaceful woodland before arriving at Castle Acre Common alongside the River Nar. This common, designated an SSSI, is considered to be the most important valley grassland site in West Norfolk. The River Nar itself is also designated an SSSI along the whole of its length because of its chalk stream features. Here, in the river’s upper reaches, traditionally managed pasture survives, and a combination of cattle grazing and hay making has created habitat for a variety of wetland plants such as southern marsh orchid, yellow rattle and bogbean. Beyond Castle Acre Common the route passes north of the entrance to the Cluniac priory just before entering Castle Acre village. Then, after skirting 12th century St James’ Church, it passes the 13th century stone Bailey Gate, formerly part of a defensive town wall, before ending back at the castle.